I originally read this book back on 1st January 2016 and loving it just as much this time round now published under Bloodhound Books. This is the first book in the Ben Whittle series by Mark Tilbury. Well I think this novel had just about everything. It made me read with just one eye open at times, laugh and it had a little romance blossoming too. When shy and insecure Ben receives a desperate phone call from his P.I. dad Geoff, saying he is in grave danger from a cult he is investigating, he knows that he is his dad’s only hope. Ben and his friend Maddie, that he secretly has a crush on, go on a rescue mission and weave their way into The Sons and Daughters of Salvation. There are some pretty disturbing characters in this novel that has its eye candy come and join us street soldiers to the disturbed souls that fall for it just because no one else gives a damn. There seems to be two very distinctive types of leaders of cults. One that is run like a business to fleece all of its worshipers from everything they own to the psychopath that really believes he should be worshiped above everything else. Ebb is one you won’t forget in a hurray. He is one scary guy. Ben is a character that you just want to get in front of to protect because he is really such a lovely lad. This shy and unassuming young man pushes himself to the limits and beyond in this story and finds that he does have a purpose in life which isn’t to be walked over. The poor lad has to face his worse fears and make a choice, fight or flight. I really enjoyed Mark Tilbury’s debut novel that took me into the very dark and disturbing world of being in this cult. He totally captures the vulnerability of people in our society and how easy it is to manipulate them. The author doesn’t over complicate the story and it flows brilliantly, making it a really great book. The humour delivered in one liners is the icing on the cake. his books are set in Oxfordshire where he was born and raised. 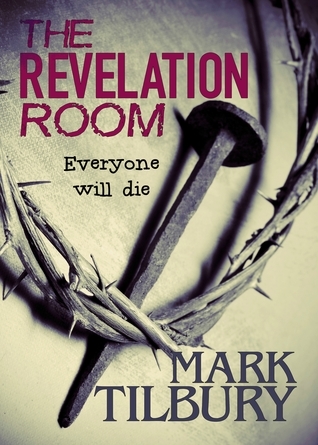 on Amazon, The Revelation Room and The Eyes of the Accused. and taking walks around the beautiful county of Cumbria.